The Penn High School Band department cordially invites you to Jazz a la Mode…A Night at the Palace on Friday, February 6th at 7:00 p.m. in the Penn High School Main Arena! Music: Provided by the Discovery Middle School Jazz Band, Grissom Middle School Jazz Band, Concord High School Jazz Band, and three Penn Jazz Ensembles. Saxophone master, Carl Coan, will be a guest soloist with each group all evening! Dessert: As always, the price of admission includes all you can eat dessert, which will be located in the Penn Cafeteria across the hall from the Main Arena. Tickets: On sale now by clicking HERE . Note: Ticket prices will increase to $7/students and $10/adults the night of the performance starting at 6:00 p.m. The doors to the main arena will open at 6:30 p.m. (please use Penn High School Door D). Come on out Friday night for a great evening full of wonderful jazz music! 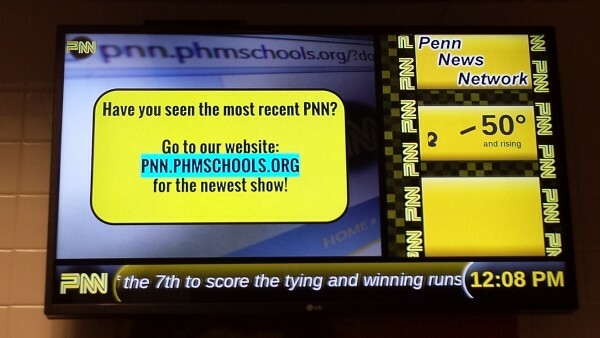 « PNN now has a weather segment!